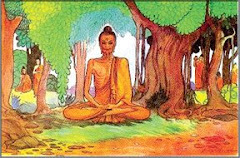 At one time, the Bhagavan was in the Garden of the Benefactor of Orphans and the Solitary, in Jeta Grove, (Jetavana Anathapindada-arama) in Sravasti state, accompanied by 250 great Bhiksu(monk)s, and 80 koti Bodhisattva-Mahasattvas, whose names are: Vajra-pani(Diamond-Hand) Bodhisattva-Mahasattva, Wisdom-Insight Bodhisattva-Mahasattva, Vajra-sena(Diamond-Army) Bodhisattva-Mahasattva, Secret-Store Bodhisattva-Mahasattva, Akasa-garbha(Space-Store) Bodhisattva-Mahasattva, Sun-Store Bodhisattva-Mahasattva, Immovable Bodhisattva-Mahasattva, Ratna-pani(Treasure-Hand) Bodhisattva-Mahasattva, Samanta-bhadra(Universal-Goodness) Bodhisattva-Mahasattva, Achievement of Reality and Eternity Bodhisattva-Mahasattva, Eliminate-Obstructions(Sarva-nivaraNaviskambhin) Bodhisattva-Mahasattva, Great Diligence and Bravery Bodhisattva-Mahasattva, Bhaisajya-raja(Medicine-King) Bodhisattva-Mahasattva, Avalokitesvara(Contemplator of the Worlds' Sounds) Bodhisattva-Mahasattva, Vajra-dhara(Vajra-Holding) Bodhisattva-Mahasattva, Ocean-Wisdom Bodhisattva-Mahasattva, Dharma-Upholding Bodhisattva-Mahasattva, and so on. At that time, there were also many gods of the 32 heavens, leaded by Mahesvara(Great unrestricted God) and Narayana, came to join the congregation. They are: Sakra Devanam Indra the god of heavens, Great Brahma god the lord of Saha world, the god of sun, the god of moon, the god of wind, the god of water, and so on. There were also hundreds of thousands of dragon kings, whose names are: Apalara dragon king, Yilapadri dragon king, Dimingnili dragon king, Earth ruling dragon king, a hundred heads dragon king, Hulusina dragon king, Dechaji dragon king, Ox head dragon king, deer head dragon king, Nanda dragon king, Upandanda dragon king, Fish son dragon king, no hot-anxiety dragon king, Sagharina dragon king, and so on, came to join the congregation. There were also hundreds of thousands of Gandharva kings, whose names are: drum-sound Gandharva king, dulcet-sound Gandharva king, a thousand arms Gandharva king, heavenly lord Gandharva king, Happy body Gandharva king, Myriad music Gandharva king, Sublime Gandharva king, Appear-as-child Gandharva king, Wonderful arm Gandharva king, Dharma-joy Gandharva king, and so on, came to join the congregation. There were also hundreds of thousands of Kinnara kings, whose names are: Wonderful mouth Kinnara king, Precious crown Kinnara king, Brightness and joy Kinnara king, Happiness Kinnara king, Wheel sublime Kinnara king, Pearls and jewels Kinnara king, Big paunch Kinnara king, Firm diligence Kinnara king, Wonderful bravery Kinnara king, a hundred mouths Kinnara king, Big tree Kinnara king, and so on, came to join the congregation. There were also hundreds of thousands of goddesses, whose names are: Uppermost goddess, Wonderful sublime goddess, Gold belt goddess, Sublime goddess, Hearing and upholding goddess, Nectar moon goddess, Pure body goddess, Precious light goddess, Flower body goddess, Heavenly face goddess, the goddess who performs the five music by the mouth, Joy goddess, Golden hair goddess, Green lotus goddess, Dharma sound preaching goddess, Wonderful joy goddess, Joy producing goddess, Wonderful sublime appearance goddess, Firm holding goddess, Donating goddess, Purified goddess, and so on, came to join the congregation. There were also hundreds of thousands of daughters of dragon kings, whose names are: Wonderful firm holding dragon girl, Muzinina dragon girl, Three hair bun dragon girl, kind countenance dragon girl, Superior luck dragon girl, Electric eyes dragon girl, Electric light dragon girl, Wonderful mountain dragon girl, Hundreds of kinfolks dragon girl, Great medicine dragon girl, Moonlight dragon girl, One head dragon girl, Hundreds of arms dragon girl, Accept and upholding dragon girl, No vexation dragon girl, Virtuous sublime dragon girl, White cloud dragon girl, Vehicle riding dragon girl, Future dragon girl, Plenty of relatives dragon girl, Sea paunch dragon girl, Face covering dragon girl, Dharma throne dragon girl, Wonderful hand dragon girl, Ocean depth dragon girl, Wonderful superior luck dragon girl, and so on, came to join the congregation. There were also hundreds of thousands of Gandharva girls, whose names are: Lovely face Gandharva girl, Enjoy donating Gandharva girl, Invisible Gandharva girl, Wonderful luck Gandharva girl, Vajra hair Gandharva girl, Wonderful hair Gandharva girl, Forest Gandharva girl, hundreds of kinds of flowers Gandharva girl, Flower opening Gandharva girl, Precious hair Gandharva girl, Wonderful stomach Gandharva girl, Lucky king Gandharva girl, Drum sound Gandharva girl, Wonderful sublime Gandharva girl, Rich gifts Gandharva girl, Dharma enjoying Gandharva girl, Dharma donating Gandharva girl, Green lotus Gandharva girl, Hundreds of hands Gandharva girl, Lotus luck Gandharva girl, Huge lotus Gandharva girl, Pure body Gandharva girl, Free traveling Gandharva girl, Earth donating Gandharva girl, Fruits donating Gandharva girl, Lion steps Gandharva girl, Kumunava Gandharva girl, Wonderful mind Gandharva girl, Kindly donating Gandharva girl, Heavenly language Gandharva girl, Enjoy forbearance Gandharva girl, Enjoy true quietness Gandharva girl, Precious teeth Gandharva girl, Sakra-devanam-Indra joy Gandharva girl, World lord kinfolk Gandharva girl, Deer king Gandharva girl, Transformation and luck Gandharva girl, Flame peak Gandharva girl, Liberate from greed Gandharva girl, Liberate from anger Gandharva girl, Liberate from ignorance Gandharva girl, Good knowing advisors relatives Gandharva girl, Precious throne Gandharva girl, Going and coming Gandharva girl, Fire light Gandharva girl, Moonlight Gandharva girl, Universal illuminating eyes Gandharva girl, Golden shining Gandharva girl, Favor to good knowing advisors Gandharva girl, and so on, came to join the congregation. There were also hundreds of thousands of Kinnara girls, whose names are: Single mind Kinnara girl, Deep meaning Kinnara girl, Wind traveling Kinnara girl, Water traveling Kinnara girl, Space riding Kinnara girl, Speed Kinnara girl, Riches donating Kinnara girl, Wonderful teeth Kinnara girl, motionless luck Kinnara girl, Defiled realms Kinnara girl, Blazing universal light Kinnara girl, Wonderful luck Kinnara girl, Precious box Kinnara girl, Discern riches Kinnara girl, Beauty and sublime Kinnara girl, Vajra face Kinnara girl, Golden Kinnara girl, extraordinary wonderful sublime Kinnara girl, Wide forehead Kinnara girl, Surrounds good knowing advisors Kinnara girl, Worlds ruling Kinnara girl, Spaces protecting Kinnara girl, Sublime king Kinnara girl, Pearl hair bun Kinnara girl, Total retention pearl Kinnara girl, Surrounded by wise persons Kinnara girl, Hundreds of names Kinnara girl, Lifespan giving Kinnara girl, Buddhist Dharma protecting and upholding Kinnara girl, Dharma realm guarding Kinnara girl, Superior sublime Kinnara girl, Kshana superior Kinnara girl, Seeks for Dharmas and constantly upholding Kinnara girl, Often seen Kinnara girl, Fearless Kinnara girl, Yearn for the liberation Kinnara girl, Always secret Kinnara girl, Total retention driving Kinnara girl, Blade light and flame Kinnara girl, Earth traveling Kinnara girl, Guardian heavenly lord Kinnara girl, Wonderful heavenly lord Kinnara girl, Treasure king Kinnara girl, Forbearance unit Kinnara girl, Practice donating Kinnara girl, Many dwellings Kinnara girl, Weapon holding Kinnara girl, Wonderful sublime Kinnara girl, Wonderful mind Kinnara girl, and so on, came to join the congregation. There were also hundreds of thousands of Upasaka and Upasika came to join the congregation. There were also innumerable monks and laypersons, hundreds of thousands of non-Buddhists such as Nirgranthas (Jain), and so on, came to join the congregation. 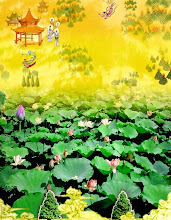 At that time, a great brilliant light was emitted from the Great Avichi hell, the light fully illuminated the Jeta grove garden and made the garden become completely purified. Thereupon, the subtle and perfect columns adorned with heavenly Mani treasures appeared, and the huge buildings adorned with gold and treasures appeared. In the buildings, there were some gold rooms with silver doors, some silver rooms with gold doors, some rooms made of interlaced gold and silver, with the doors made of interlaced gold and silver. There were also some precious sublime palaces made of interlaced gold and silver, with the columns made of interlaced gold and silver, and adorned with wonderful treasures. There were also some gold palaces with silver columns, some silver palaces with gold columns, some silver palaces with the columns adorned with myriads of heavenly wonderful treasures. On the trees in the Jeta grove, myriads of heavenly wonderful treasures appeared adorning the trees. Furthermore, many gold Kalpataru trees with silver leaves, adorned with myriads of treasures, also appeared. Hanging over those trees, there were hundreds of kinds of superior wonderful clothes such as Kausika, etc., and there were hundreds of thousands of precious pearl necklaces interweaving like nets over the trees. Those trees were also adorned with hundreds of thousands of superior wonderful precious crowns, jade ear-ornaments, silk belts, and various tinkling treasures. Adorning those trees, there were also various superior wonderful flowers, superior wonderful beds, and subtle precious boxes. Such myriads of sublime Kalpataru trees, which appeared in the grove, were numbered in hundreds of thousands. Furthermore, in the garden of Jeta grove, the steps of the doors and pavilions became made of diamonds and wonderful treasures, the pavilions were adorned with countless extraordinary wonderful colorful silk, pearls and precious necklaces. In the garden, hundreds of thousands of superior wonderful precious pools also appeared, with full of waters of the eight merits and virtues. In the pools, there were also plenty of various superior perfect flowers, which are called Utpala flowers, Kumuda flowers, Pundarika flowers, Mandara flowers, Maha-Mandara flowers, Udumbara flowers, etc. There were also various superior wonderful flowering trees, which are called Campaka flowering trees, Kalavela flowering trees, Patala flowering trees, Wonderful liberation flowering trees, Fragrant rain flowering trees, Wonderful mind flowering trees, etc. Those flowering trees are very pleasing. 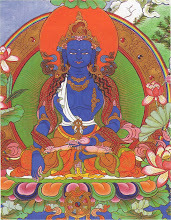 When such a rare, pure, wonderful and sublime scene was manifesting in Jeta grove garden, in the midst of the congregation, Eliminate-Obstructions Bodhisattva-Mahasattva arose from his seat, uncovered his right shoulder, placed his right knee on the ground, joined his palms respectfully, looked at the face of the Bhagavan with reverence and said to the Buddha: "Rare Bhagavan, now I have a question in my mind, and wish that the Bhagavan can allow me to ask. Bhagavan, now there is a great brilliant light in this place, where did it come from? For what cause and relationship did this rare scene appear?" The Bhagavan then told Eliminate-Obstructions Bodhisattva: "Virtuous man, all of you should listen attentively, and I am going to analyze and expound for you. 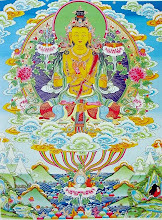 This great brilliant light is caused by Arya(sage) Avalokitesvara Bodhisattva-Mahasattva, because he had just entered into Great Avichi hell to rescue all the sentient beings who were suffering from extreme afflictions and ferry them to the shore of liberation. 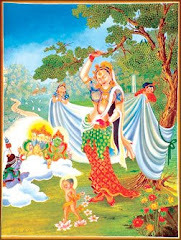 Having saved those sentient beings, he then entered into a big city to rescue and ferry all the hungry ghosts who were suffering there"
Eliminate-Obstructions Bodhisattva Mahasattva then went on to ask the Buddha: "Bhagavan, the Avichi hell is surrounded by iron wall, and its ground is also made of iron. There is no gap on the wall around it. The violent fires are constantly burning fiercely and producing smoke and flames. In such a hell of evil destiny, there was a huge caldron with boiling water in it, hundreds of thousands of kotis of nayutas of sentient beings were all thrown into the caldron, just like the beans being cooked in a boiler. While the water is boiling, they float up and down uninterruptedly and then they will be cooked into mashes. The sentient beings in Avichi hell suffer from such afflictions. Bhagavan, so what method did Arya Avalokitesvara Bodhisattva Mahasattva use to enter it?" The Bhagavan then told Eliminate-Obstructions Bodhisattva Mahasattva: "Virtuous man, for example, a wheel turning sage king can enter into the heavenly Mani treasures garden, likewise, virtuous man, when Arya Avalokitesvara Bodhisattva Mahasattva was entering into the Great Avichi hell, nothing can obstruct his body. At that time, all the torturing instruments in Avichi hell cannot hurt the Bodhisattva's body, the violent fire were all quenched and became refreshingly cool pools. At that time, the Yama jailers of the hell became more astonished than ever before and thought: 'Why did this place suddenly transform into such a unusual scene?' At that moment, Avalokitesvara Bodhisattva Mahasattva had broken into the hell, destroyed the caldron, and quenched the violent fire. The huge fire pits became precious pools, with some lotuses as large as cartwheels in them." to tame and subdue the extreme atrocities. and make all who see you have no fear. your wisdom is as vast as the four great oceans. including tortoises, fishes, aquatic animals, and so on. Your uppermost wisdom is like a mountain. and have full of blessings, wisdom and sublime. It becomes a refreshingly cool place. the one who bestows with no fear. and constantly keep the torch of Dharma burning. and your wonderful stomach is like a deep Dharma ocean. and the wonderful virtues appear in your mouth. and are the uppermost immortal one. and give alms to them with no fear. like a cover protecting streamers. there is an infallible-lasso (Amogha-pasa). and liberate all living beings from myriads of afflictions. and make them achieve the Bodhi Way. (tathata); 'true thusness,' suchness. Things as they are. For something to be as it is. The establishment of reality as empty. 'Reality-nature', the nature of existence. 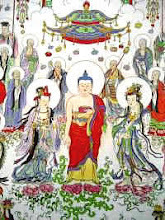 Having made offerings to Avalokitesvara Bodhisattva Mahasattva by myriads of glorifications, Yama king circumambulated the Bodhisattva three times, and then went back to his residence." At that time, Eliminate-Obstructions Bodhisattva asked the Buddha again: "Bhagavan, did that Avalokitesvara Bodhisattva Mahasattva come to join this congregation after saving those living beings from sufferings?" The Buddha told Eliminate-Obstructions Bodhisattva: "Virtuous man, having left from the Great Avichi hell, that Avalokitesvara Bodhisattva had then entered into the big city of hungry ghost. Inside that city, there were innumerable hundreds of thousands of hungry ghosts, with fire flame spurting out from their mouths. Their faces were withered and their bodies were scraggy, their hair were unkempt and their body hair were all sticking up, their stomachs were as large as a mountain and their throats were as thin as a needle. When Avalokitesvara Bodhisattva Mahasattva reached that big city of hungry ghost, all the flaming karma fire in the city suddenly quenched and the city became refreshingly cool. At that time, a ghost general who was guarding the city's gate, with a huge body and two deep red eyes, and a hot iron club holding in his hand, aroused a merciful mind: 'From now on, I can not guard this evil karma place.' At that time, Avalokitesvara Bodhisattva Mahasattva aroused the great compassionate heart, he issued forth rivers from each of his ten fingertips, issued forth rivers from each of his toes, and issued forth big rivers from every pore on his body. The hungry ghosts then drank the water of the rivers. Having drunk the water, their throats became larger and their bodies and appearances became perfect. Subsequently, they gained various delicious drinks and foods, then all of them ate their fill." "Having gained these benefits and comforts, each of those hungry ghosts thought carefully: 'Why can people in South Jambudvipa often have refreshing cool, peace, and happiness? 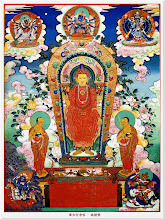 Oh, In that place, there are virtuous persons who constantly respect, carry out filial piety, and sustain their parents; there are virtuous persons who are generous in giving and respectfully practice the teachings of good knowing advisors; there are wise and knowledgeable persons who constantly enjoy Mahayana; there are virtuous persons who can practice the eight sage path(noble eightfold path)s; there are virtuous persons who can knock Dharma-drums(ghanta); there are virtuous persons who can repair the damaged monasteries(Samgharama); there are virtuous persons who can repair the damaged temples; there are virtuous persons who can offer, sustain and respect Dharma masters; there are virtuous persons who can see the path of Tathagatas; there are virtuous persons who can see the path of Bodhisattvas; there are virtuous persons who can see the path of pratyeka-buddhas; there are virtuous persons who can see the path of Arhats.' They thought: 'In South Jambudvipa, there are so many cultivating events.' 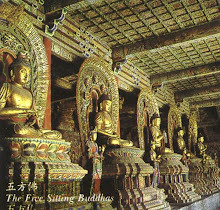 At that time, from this Mahayana Sublime Treasure King Sutra, a delicate and wonderful sound uttered naturally. After those hungry ghosts had heard this sound, although the body-view(view of a self in the body) that they were attaching to was as huge as a mountain, that body-view, together with their myriads of afflictions, were completely destroyed by the Vajra wisdom pestle, thereupon, all of them were reborn in Utmost Bliss world and became Bodhisattvas, with a same name 'Discretionary (pravarana) Mouth'." 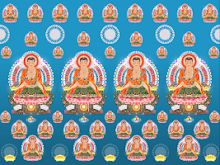 "When Avalokitesvara Bodhisattva Mahasattva had saved those sufferings, he then went to the worlds of other directions to save sentient beings and ferry them to the liberation." At that time Eliminate-Obstructions Bodhisattva asked the Buddha again: "Bhagavan, do Avalokitesvara Bodhisattva Mahasattva come to this world to save and ferry sentient beings?" The Bhagavan said: "Virtuous man, the Avalokitesvara Bodhisattva Mahasattva is always saving and ferrying immeasurable hundreds of thousands of kotis of nayutas of sentient beings and never rest, his great majestic powers surpass the Tathagatas'." Eliminate-Obstructions Bodhisattva asked: "Bhagavan, why does Avalokitesvara Bodhisattva Mahasattva have such great majestic powers?" 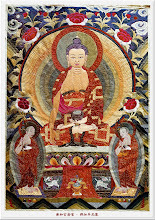 The Buddha said: "Virtuous man, in the past kalpas, there was a Buddha who appeared in the world, whose name is Vipasyin Thus come One, One worthy of offerings, One of proper and pervasive knowledge, One perfect in clarity and practice, Well gone One, Knower of the secular world, Unsurpassed One, Taming and subduing hero, Teacher of gods and humans, Buddha, World honored One. At that time I was a son named Wonderful fragrance mouth, of a magnate's family. From that Buddha, I had heard about the mighty sacrosanct power, merits, and virtues of Avalokitesvara Bodhisattva." Eliminate-Obstructions Bodhisattva then said: "Bhagavan, what were the mighty sacrosanct power, merits, and virtues of Avalokitesvara Bodhisattva Mahasattva that you had heard about?" and the earth is his throne. were born from this body.'" "Virtuous man, after I had heard about that from Vipasyin Tathagata, later, there was another Buddha appeared in the world, whose name is Sikhin Thus come One, One worthy of offerings, One of proper and pervasive knowledge, One perfect in clarity and practice, Well gone One, Knower of the secular world, Unsurpassed One, Taming and subduing hero, Teacher of gods and humans, Buddha, World honored One. Eliminate-Obstructions, at that time I was Fearless Bestowing Bodhisattva Mahasattva. 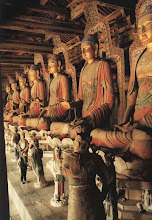 From that Buddha, I had also heard about the mighty sacrosanct power, merits, and virtues of Avalokitesvara Bodhisattva." Eliminate-Obstructions Bodhisattva said: "Bhagavan, what were the mighty sacrosanct power, merits, and virtues of Avalokitesvara Bodhisattva Mahasattva that you had heard about?" The Buddha said: "At that time, in a congregation of Sikhin Tathagata, all gods, dragons, Yaksas, Asuras, Garudas, Mahoragas, human and non-human beings had assembled. 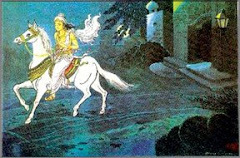 When the Bhagavan was about to speak Dharma in the congregation, he emitted myriads of multicolored light, including green light, yellow light, orange light, white light, red light, Sphatika colored light, golden light. 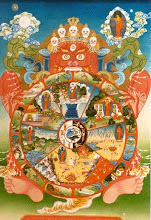 The light universally illuminated all the worlds of the ten directions, and then returned, circumambulated the Buddha three times, and went into his mouth. At that time, a Bodhisattva Mahasattva in the congregation, whose name is Rata-Pani(Treasure-Hand), arose from his seat, uncovered his right shoulder, placed his right knee on the ground, joined his palms respectfully, and said to the Bhagavan: 'For what cause and relationship did this holy scene appear?' That Buddha said: 'Virtuous man, in Utmost Bliss world, there is a Bodhisattva Mahasattva named Avalokitesvara, he is about to come here, so I manifested this holy scene.'" 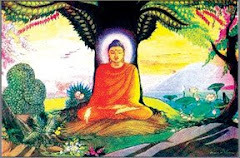 "When Avalokitesvara Bodhisattva was about to come, myriads of Kalpataru trees, flower trees, Kumuda flower trees, and Campaka flower trees appeared. Furthermore, varied flowers, precious pools and trees also appeared. The sky rained down wonderful flowers, various jewels, Manis, pearls, emeralds, spiral shells, jades, corals, and many other treasures. A lot of heavenly clothes were also rained down like masses of cloud. 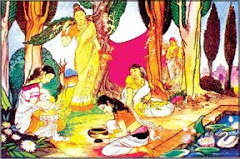 At that time, in the Jeta grove Anathapindika garden, the seven treasures also appeared, their names are: Gold wheel treasure, Elephant treasure, Horse treasure, Pearl treasure, Goddess treasure, Repository mastering treasure, Army mastering treasure. When those seven treasures appeared, the ground became completely golden." "And when Avalokitesvara Bodhisattva Mahasattva was departing from the Utmost Bliss world, the ground was quaking in six different ways. 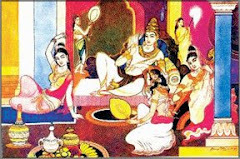 Rata-pani Bodhisattva Mahasattva then asked the Bhagavan again: 'For what cause and relationship did this holy scene appear?'" "That Buddha said: 'Virtuous man, the Avalokitesvara Bodhisattva Mahasattva is coming to here, so this holy scene appeared.' At that time, the sky also rained down comfortable wonderful flowers and wonderful lotuses. 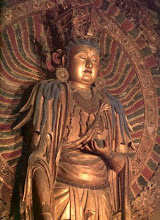 Then Avalokitesvara Bodhisattva arrived, with a golden brilliant thousand petals lotus holding in his hand. He bowed at the feet of that Buddha, offered up the lotus to that Bhagavan and said: 'Infinite-Life(Amitayus) Buddha told me to come with this lotus.' The Bhagavan then accept the lotus and placed it on the left side." "That Buddha said to Avalokitesvara Bodhisattva Mahasattva: 'Why do you now manifest such sacrosanct power, sublime merits and virtues?' 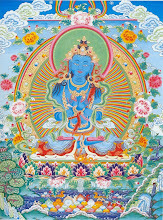 Avalokitesvara said: 'I do it for saving and ferrying all the sentient beings from the evil destinies, including the hungry ghost realms, the Avichi hell, the Black rope hell, the hell of the repetition of painful life, the burning hell, the roasting hell, the caldron hell, the icy water hell, etc. For all the living being in those great hells, I will save all of them and pull them up from the evil destinies, and make them achieve Anuttara-Samyak-Sambodhi.' When Avalokitesvara Bodhisattva finished saying that, he bowed at the feet of the Buddha, and then suddenly disappeared, like a flame vanishing into the space." "At that time, Rata-pani Bodhisattva said: 'Bhagavan, now I have a question to ask the Tathagata, please explain for me. What merits and virtues does Avalokitesvara Bodhisattva have, so that he can manifest such holy power?'" "The Buddha said: 'If anyone offers and sustains the Buddhas as many as Ganges river sands, with heavenly wonderful clothes, kasayas, drinks, foods, soups, medicines, seats, beds, etc. The blessings and virtues gained by that is equal to the blessings and virtues of one hair tip of Avalokitesvara Bodhisattva.'" 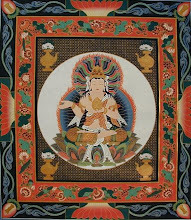 "'Virtuous man, for another example, suppose the four great continents are always raining, the rain continues for days and nights in all the twelve months in a year, I can count the number of the drops of the rain water one by one, but virtuous man, I can not finish speaking the number of all the blessings and virtues of Avalokitesvara Bodhisattva.'" "'Virtuous man, for another example, suppose there are four great oceans, each is 84 thousand yojana in depth, in width and in length, I can count the number of the water drops of those four oceans one by one, but virtuous man, I can not finish speaking the number of all the blessings and virtues of Avalokitesvara Bodhisattva.'" "'Virtuous man, for another example, for all the four-legged sentient beings in the four great continents, such as lions, elephants, horses, tigers, wolves, bears, deer, cows, sheep, and so on, I can count the number of hair of all their bodies one by one, but virtuous man, I can not finish speaking the number of all the blessings and virtues of Avalokitesvara Bodhisattva.'" "'Virtuous man, for another example, if some person uses heavenly gold and treasures to make Tathagatas' statues as many as atoms in the universe, when done, he then makes all kinds of offerings for one day, I can fully count the number of blessings and virtues that he gains, but virtuous man, I can not finish speaking the number of all the blessings and virtues of Avalokitesvara Bodhisattva.'" "'Virtuous man, for another example, I can count the number of leaves of all forests one by one, but I can not finish speaking the number of all the blessings and virtues of Avalokitesvara Bodhisattva.'" "'Virtuous man, suppose all the men, women, boys and girls in the four great continents have attained the fruitions of Stream-enterer(Srota-apanna), Once-returner(Sakrd-agami), Non-returner(Anagamin), Arhat, Pratyeka-buddha, and Bodhi, then all those blessings and virtues are equal to the blessings and virtues of one hair tip of Avalokitesvara Bodhisattva.'" 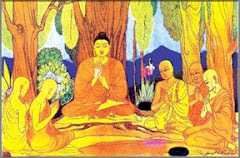 "Then Ratna-pani Bodhisattva said to the Bhagavan: 'I never saw or heard of any Buddha, Tathagata who has such blessings and virtues. 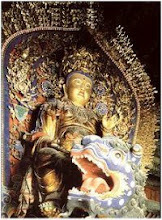 Bhagavan, as a Bodhisattva, how can Avalokitesvara has such blessings and virtues?'" "That Buddha said: 'Virtuous man, not only me in this realm, even if innumerable Tathagata, Arhat, Samyak-sambuddhas of other directions all get together in one place, they also cannot finish speaking the blessings and virtues of Avalokitesvara Bodhisattva. Virtuous man, if anyone in this world can keep remembering the name of Avalokitesvara Bodhisattva Mahasattva, this person will be far away from the sufferings of birth, aging, illness, death and transmigration. He will be reborn quickly in the Utmost Bliss world, just like a goose king traveling by wind, and then personally see the Infinite-Life(Amitayus) Tathagata and hear wonderful Dharmas. Then this person will never suffer from transmigration, greed, anger, ignorance, aging, illness, death, or hungry. By the majestic power of Dharma, he will be born miraculously from a lotus, instead of suffering from being born from a womb. He can always reside in that world to wait for the time that Avalokitesvara Bodhisattva Mahasattva have saved and ferried all sentient beings and liberated all of them so that the Bodhisattva's solid vows can be fulfilled.'" "Then Rata-pani Bodhisattva asked the Bhagavan: 'When will this Avalokitesvara have saved and ferried all sentient beings and liberated all of them, so that his solid vows can be fulfilled?'" "The Bhagavan said: 'There are infinite sentient beings. They constantly suffer from birth, death and transmigration and have no rest. In order to save and ferry those sentient beings and make them achieve the Bodhi Way, this Avalokitesvara manifests different incarnations to speak Dharmas for different types of sentient beings.'" "'For those who should be ferried to the shore of liberation through the body of a Buddha, he appears in a Buddha body and speaks Dharmas for them.'" "'For those who should be ferried through the body of a Bodhisattva, he appears in a Bodhisattva body and speaks Dharmas for them. '" "'For those who should be ferried through the body of a Pratyeka-buddha, he appears in a Pratyeka-buddha body and speaks Dharmas for them.'" "'For those who should be ferried through the body of a voice-hearer(Sravaka), he appears in a voice-hearer's body and speaks Dharmas for them.'" "'For those who should be ferried through the body of Mahesvara, he appears in a Mahesvara body and speaks Dharmas for them.'" "'For those who should be ferried through the body of Narayana, he appears in a Narayana body and speaks Dharmas for them.'" "'For those who should be ferried through the body of Brahma God, he appears in a Brahma God body and speaks Dharmas for them.'" "'For those who should be ferried through the body of Sakra devanam Indra, he appears in a Sakra devanam Indra body and speaks Dharmas for them.'" "'For those who should be ferried through the body of the god of sun, he appears in a body of the god of sun and speaks Dharmas for them.'" "'For those who should be ferried through the body of the god of moon, he appears in a body of the god of moon and speaks Dharmas for them.'" "'For those who should be ferried through the body of the god of fire, he appears in a body of the god of fire and speaks Dharmas for them.'" "'For those who should be ferried through the body of the god of water, he appears in a body of the god of water and speaks Dharmas for them.'" "'For those who should be ferried through the body of the god of wind, he appears in a body of the god of wind and speaks Dharmas for them.'" "'For those who should be ferried through the body of dragon, he appears in a dragon's body and speaks Dharmas for them.'" "'For those who should be ferried through the body of Vinayaka, he appears in a Vinayaka's body and speaks Dharmas for them.'" "'For those who should be ferried through the body of Yaksa, he appears in a Yaksa's body and speaks Dharmas for them.'" "'For those who should be ferried through the body of the Knowledgeable heavenly king (Vaisravana), he appears in a body of the Knowledgeable heavenly king and speaks Dharmas for them.'" "'For those who should be ferried through the body of a human king, he appears in a human king's body and speaks Dharmas for them.'" "'For those who should be ferried through the body of an officer, he appears in an officer's body and speaks Dharmas for them.'" "'For those who should be ferried through the body of the parents, he appears in the parents' body and speaks Dharmas for them.'" "Virtuous man, in such manners, according to how the sentient beings could be ferried to the liberation, Avalokitesvara Bodhisattva Mahasattva manifests various incarnations and speak Dharmas for them, to save all sentient beings and make them achieve the state of the Tathagatas' Nirvana.'" "Then Rata-pani Bodhisattva said to the Bhagavan: 'I never saw or heard of such unimaginable and rare things. Bhagavan, the abilities of Avalokitesvara Bodhisattva Mahasattva are really unimaginable and unprecedented.'" "The Buddha said: 'Virtuous man, in a diamond cave in the southern continent Jambudvipa, there are immeasurable hundreds of thousands of millions of kotis of nayutas of Asuras. Virtuous man, in that place, Avalokitesvara Bodhisattva Mahasattva appeared in an Asura body and spoke this Mahayana Sublime Treasure King Sutra for those Asuras. When those Asuras heard this sutra, they all aroused the merciful heart, they supported the feet of Avalokitesvara Bodhisattva Mahasattva with their palms and listened to the correct Dharma, and all gained the Dharma joy.'" "'If anyone can hear this sutra king, also can read and recite it, then if this person has any of the five heinous sins, those sins will all be eliminated. When he is about to die, there will be twelve Tathagatas who come to receive him, saying: 'Virtuous man, you need not fear, because you had heard the Mahayana Sublime Treasure King Sutra. ', and then will reveal various paths to the Utmost Bliss world, in which there are subtle and wonderful covers, heavenly crowns, ear-ornaments, superior wonderful clothes, etc. When such a scene appear, he will surely be reborn in the Utmost Bliss world upon his death.'" "'So, Rata-pani, Avalokitesvara Bodhisattva Mahasattva, the greatest matchless one, can also appear in a Asura's body and make the Asuras reach the place of Nirvana.'" "At that time, Rata-pani Bodhisattva bowed at the feet of the Bhagavan, with his head touching the ground, and then withdrew."